The other day I decided to be a little bit brave and pop in to one of the charity shops in town in search of even more books. I know, I'm a menace. You lot, like myself, love a good nose so I thought I'd share the two books that I picked up as well as offering up a few little thoughts on the both of them. I'm just that thoughtful. Please let me know what you think about the books in the comments below! P.S Hello Moira! Thanks for reading! I found this at the back of the book shop in the classics section and instantly pounced on it. The beautiful front cover design and the unbroken spine pretty much sold this copy to me. TO THE LIGHTHOUSe, in an extremely basic sense, is centred around the Ramsey family and their summer visits to the lighthouse. I have a difficult relationship with Woolf. I can never seem to read her work with the same fluidity that I am able to with other novelists. However, I am determined to enjoy this novel wholeheartedly. I'm actually studying this for my Modernism class so I don't really have a choice but to read it! It's not that I don't love the use of stream of consciousness, as well as the numerous other things that Modernism stands for and is characterised by, because I do. I think it's just sometimes difficult to sit down with a novel that smothers its plot and delicious character development in the ordinary and the introspective, even though that too is something I adore. Bloody hell, I'm confused. If you haven't guessed by now, I love literature that challenges me and sates my desire for learning and for immense feeling. I really hope this novel and I will get along swimmingly. I, of course, will let you know! I may shock you when I tell you that I opted to see the film adaptation prior to reading the book. Shock horror! I've sold out, haven't I?! I'm hoping that it won't ruin my reading experience because I have heard nothing but good things about this book. 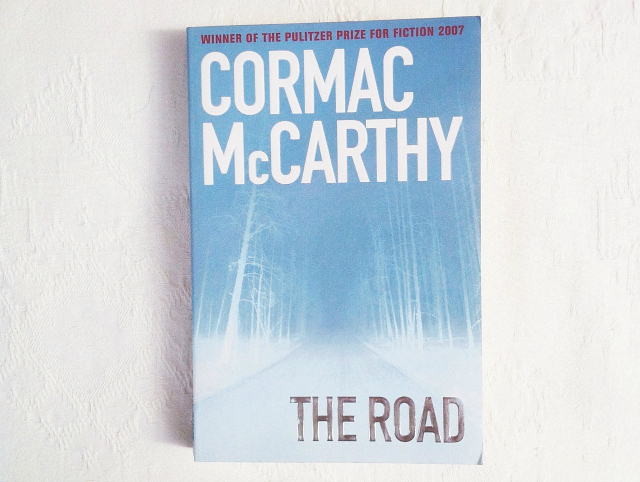 If you aren't aware, THE ROAD follows a father and son as they navigate a post-apocolyptic world. I was in bits at the film but I'm pretty sure that the book will cut me up into a million more pieces. I've read the first page and I think the tone is pretty much perfect so we'll see how it goes. I think I'll put this quite low down on my 'To Read pile' in order to distance it from the film adaptation so as not to spoil it but I'm looking forward to reading it in a strange oh-god-i'm-going-to-weep way. Move it up the list, it's awesome!! I love those wordsworth classics, they always have the most beautifully muted covers. Ditto with Virginia Woolf- I've always had to really focus to get through her novels for some odd reason. If you ever come to visit this neck of the woods, I'm going to take you to see Charleston Manor, the farmhouse where the Bloomsbury set all gathered for their affairs and various creative persuits. It is filled with the paintings and writings of them all, and about 20 mins away from my house. 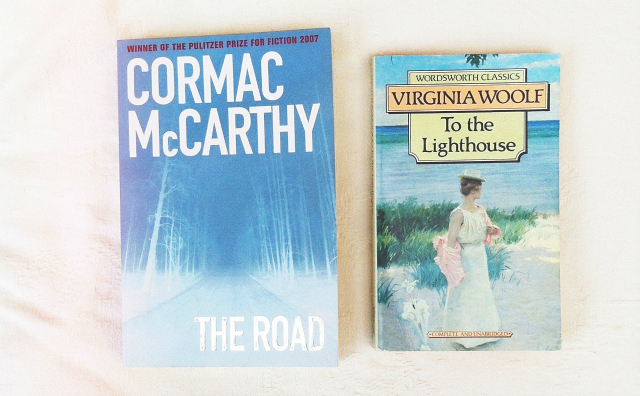 I studied To the Lighthouse for a modernism module at Uni too and really enjoyed it. I’m a fan of Virginia Woolf but I understand what you mean about her work - I’ve found that perservering with it is really worth it though. I’d be interested to hear what you think of the novel! 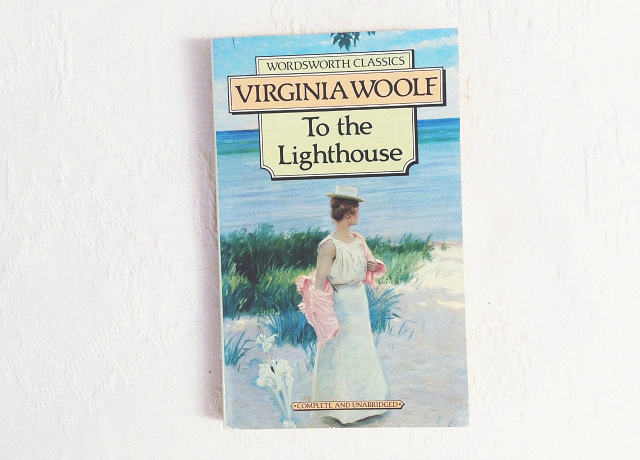 I also find Woolf difficult, however To the Lighthouse is one of her easier reads. I really liked it. I think everything happens for a reason even if we can't see it at first. You are all ready looking at the positive side of things though so bravo. I love finding books in charity shops. you never know what you are going to find. Its like treasure hunting.